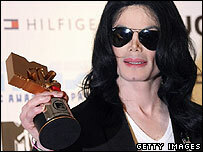 Jackson, 47, received an honorary "Legend Award" at MTV's Japan Music Video Awards in Tokyo. "I thank all the people who believed in me. I believe in you," he said. "I thank my children, Paris, Prince, and Blanket, who have been there for me." The singer has avoided the limelight since his US trial ended in June 2005. He left his famous Neverland ranch in California, and set up home in Bahrain, although financial problems have kept the performer in the headlines since his acquittal. Introduced as "the king of pop, the king of rock and the king of soul," Jackson made a "peace" gesture as he walked onstage at the Yoyogi Olympic stadium to the sound of his hit song Thriller. "I'd like say to the Japanese people from the bottom of my heart, 'I love you very, very much,'" he said. "I thank the fans around the world and I thank the fans in Japan. I promised myself I wouldn't be emotional when I got up here," he added as his voice cracked and faded. "I think you are very sweet, generous and kind people. I thank all the people who believed in me. I believe in you." Backstage, Jackson was asked by reporters if he had a message for his fans. "I love you and thank you for your loyalty," he said, bowing and putting his hand to his heart. Several hundred fans greeted him as he arrived at the venue, surrounded by a team of bodyguards. 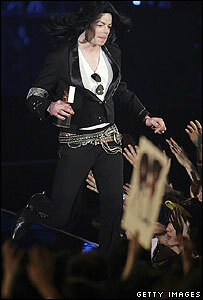 Jackson, wearing a jewellery-embroidered black blazer with tight black trousers and a white t-shirt, did not speak as he arrived, but waved and raised a forefinger to acknowledge reporters outside the venue. 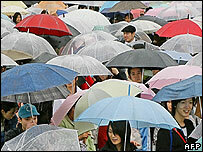 The crowd, who were not deterred by heavy rain, held up signs reading: "We love you, Michael," and "Welcome to Japan." "I believe that Michael is innocent and has done nothing wrong. I want him to be free from pressure so he can perform music once again," said fan Hideki Endo, 43.